The 32-year-old violinist Hilary Hahn has been at the lonely pinnacle of the classical A-list since she was all of 16 years old. It's not exactly a sphere that rewards, or even encourages, curiosity: The language used to assess soloists in Hahn's rarefied air comes disturbingly close the the kind used to appraise prize ponies, and the city-to-city nature of the violin-concerto circuit can make for a life that is almost as cloistered and repetitive. But Hahn has resisted stagnation, recording with alt-country singer/songwriter Josh Ritter, the folk singer Tom Brosseau, and even ...And You Will Know Us by the Trail of Dead (that's her on Worlds Apart's "To Russia My Homeland"). She never seems to be insisting on a strident break from the world of orchestral tours, commissions, and Tchaikovsky concertos with any of these new projects -- just looking for something fresh and interesting to do. It has made her career one of the most refreshingly graceful ones in classical music. No project she has undertaken has felt forced, and that includes her decision to hole up in Iceland for two months to make a record with Hauschka. Hauschka (real name: Volker Bertelmann) is a German pianist and indie classical composer who plays his piano "prepared," i.e., with small things placed on the piano's strings to produce new tones, à la John Cage. Over a series of albums filled with wistful miniature sketches, he's built a weird little sound world where the grotesque walks arm-in-arm with the twee. His pieces evoke a world of broken, rickety instruments, populated entirely by small, limping things. They can be nerve-rendingly cute and cloying, but at their best, they evoke the peculiar sadness you might feel when looking at, say, a toy-strewn suburban lawn. 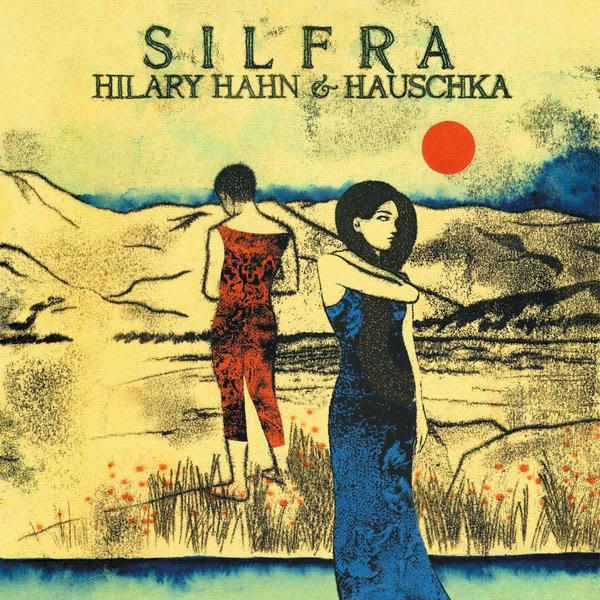 Silfra is the result of Hahn and Hauschka's disappearing into an Iceland studio, feeling their way around each other, and recording an album based on their resulting improvisations. This sounds like a recipe for an undercooked mess, but Silfra succeeds where Hauschka's solo records haven't always, in part because his world sounds fuller and more inviting with collaborators in it. Silfra feels and sounds like two serious-minded musicians growing increasingly comfortable with each other, allowing themselves to be playful and silly. Together, they have managed to build a livelier, more bustling version of Hauschka's winsome snowglobe universe. Hahn, for her part, does something that could be considered shocking for violinists in her circle: she willfully drains her million-dollar tone of most of its prettiness. Her playing on Silfra is often sickly, wheezing or shrill, in keeping with the slightly damaged sound of Hauschka's piano. On "North Atlantic", she plays a mournful melody with a breathy, anemic tone, while Hauschka's piano produces a dry "skree" sound that pokes the eardrum like a needle. She begins "Draw a Map" with a forceful gypsy dance that starts hobbling shortly after it gets started: The two of them doodle all over the melody's pristine surface with pockmarks and scribbles. If there's a dance being done here, it's on at least one bad leg.